Simple RSS Reader app for Windows 8 allows you to fetch content form any RSS/Atom feed. This Windows 8 RSS reader app comes handy in situations where you desire for an easy solution to track new content from your favorite websites. Simple RSS Reader app is 100% free to use and can be easily obtained from ‘Social’ section of Windows Store. Here, you can add multiple RSS feeds in a highly convenient manner. The capabilities of Simple RSS Reader are not just restricted to fetching content from the feed; it also provides a user-friendly interface for reading the webpages as well. On launching Simple RSS Reader app for the first time you will be presented a blank window. To begin using it, you’ll require right clicking on the interface for displaying the top-horizontal bar. Now, your task will be to add RSS/Atom feeds. Have a look on the procedure stated below. On the rightmost corner of this Windows 8 RSS reader app exists a button stating ‘Add New Blog Feed’ button. Click on it. Then a new form will emerge on the screen. Now, enter the URL to the RSS feed of the website to be tracked. * Same procedure is to be repeated for adding any number of RSS Feeds to the app. Now, on visiting the application’s home screen the list of included RSS feeds will be presented to you. Now, click on particular RSS feed button and soon you will be shown the feeds from the selected destination. * If the feed provider provides only summary then you won’t be able to read all of it. Well! need not to worry, just right-click and select ‘View Webpage’ button from top-right region. The others buttons on the top horizontal bar can also be utilized accordingly. Also, check out our posts on Stock Market Apps, eBook Apps, and Search Engine Apps. Then click on ‘View in Windows Store’ button. Upon being redirected to app overview page, click on ‘Install’ button. * The size of the application is only 81 KB and it requires permission for accessing your Internet connection. Simple RSS Reader is a really nice Windows 8 app. It’s free, easy to use, and very lightweight. 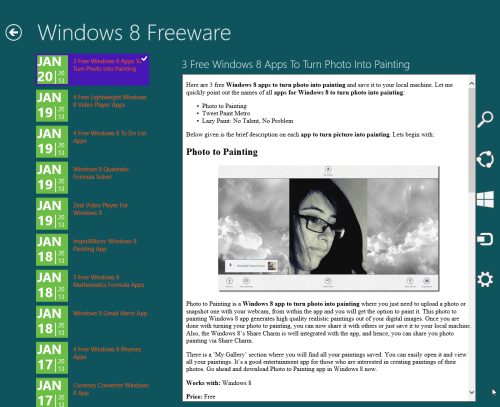 Dark RSS is another windows 8 app with similar features.